Unfortunately a sad statistic, particularly marsupials, with Australian animals is the high amount killed by road strike each year. More often than not, whilst driving along a freeway or rural highways you see native animals that have been hit by a car. If you see an animal on the side of the road, if safe to do so, please consider checking if there is a pouch – there may be a joey inside that has survived! A joey can last up to 6-48 hours inside a pouch once the mother has passed away, hence why it is important to check the pouch! 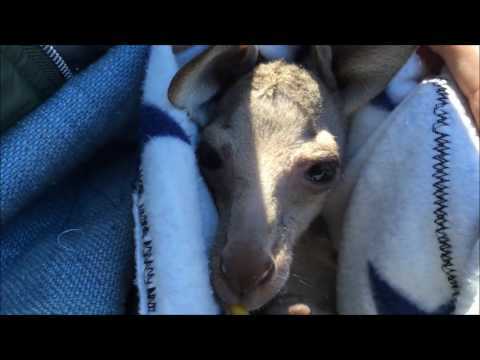 Here in this video we have Kevin an Eastern grey kangaroo joey who is now in the care of The Australian Reptile Park. He was found Morisset and is now doing extremely well enjoying bottle feeds and cuddling up to the keepers. A loving family found the mother on the side of the road, decided to check the pouch and there little Kevin was. The family wrapped him up took him home safe and warm for the night and this is where so many people make the innocent yet fatal mistake. Baby kangaroos need a particular form of milk, in fact all joeys need different milk, from wombats to Tassie devils. It is very important to know that if you find a joey bring them straight to an institution like The Australian Reptile Park or call your local wildlife carers like W.I.R.E.S or Wildlife Arc. Many people often ask us what to do if they find themselves in the above situation, so here is the Australian Reptile Park’s guide to on how to safely remove a joey from the pouch. The first thing to know is that, removing a joey from a pouch is not quite as easy as it sounds. If the mother is already at the point of rigor mortis (this is when the body gets stiff after death) the pouch opening can get quite tight, thus making is extremely hard to remove the joey. Being too rough at this stage also puts the joey at a risk of injury and this is not ideal for the joey’s long term health. It can also be difficult if the body of the mother is still soft because it is still a tight space with not much room to move. The main point to take away from this is to use extreme caution and care in the beginning stages. The joey will most likely be attached to the teat inside of the pouch as furless and just furred joeys have their lips fused and are permanently attached to the teat. If this is the case, the best option is to use a pair of scissors to cut the joey free. Again, this presents some increased risk of injury to the joey in the case of fast movements so extreme care is required. Position the mother so that the pouch opening is toward your body and use the scissors to cut the pouch to assist with the removal process whilst always keeping your hand between the joey and the scissors. Then insert your hand into the pouch and feel around for the teat at the end of the joey’s nose. Ensure that your fingers are between the scissors and the joey then make the precise cut very slowly. Remove the joey with the teat still in its mouth. If scissors are not readily available attempt to enclose the joey in your hand as much as you can. Then proceed to move your fingers to the end of the nose and gently push the sides and then ease the teat out of the mouth. Please note that this action may rip and damage the mouth so be very careful. Use a towel to assist with removal of the joey and then place both the towel and the joey inside more towels, jumpers, whatever you have. Not all joeys will be attached to the teat, some like wombats will often be found standing next to mum. However, in all cases the process is the same. Put the joey in a warm, soft wrapping that mimics a pouch. From here, bring the joey to an institution like The Australian Reptile Park, your local vet or get in touch with a local wildlife organisation such as W.I.R.E.S or Wildlife Arc.